Leah Yeary stormed to her bedroom and slammed the door. “I just don’t understand what’s gotten into you!” her mom yelled in frustration. A high school junior, Yeary knew she was struggling with anxiety and depression but didn’t know how to tell her mother. She was also falling behind in classwork, losing touch with friends, and dreading her job as a retail clerk at Aldo footwear and accessories. Yeary eventually told her mom about her mental health struggles, and she urged her to get help. During her senior year she began to speak to a private counselor in her hometown of Pottstown, Pennsylvania, and she found that the regular sessions eased her stress. Now a sophomore nursing major at Penn State University, Yeary brought her illness with her to college. If anything, she said, the feelings have only intensified, along with stress of school. In the midst of a panic attack last year, Yeary mustered the confidence to visit the fifth floor of the University Health Services building at Penn State, where she had been told that students like her could get help. But when she reached the reception desk at Counseling and Psychological Services (CAPS), she was told to go back home and phone the program for a screening before she could see a counselor. Yeary left the office disappointed and embarrassed. As soon as she got back to her dorm, she called CAPS. She wanted to see a counselor soon, to help her escape her weekly panic attacks. Have you ever considered committing suicide? No. Have you used any hard drugs in the past month or so? No. Have you considered hurting yourself or others? No. Yeary’s experience reflects a nationwide pattern, one borne out by multiple surveys. Nearly one in six college students has been diagnosed with anxiety within the last 12 months, according to the American College Health Association (ACHA). ACHA says the influx of students is straining college mental health centers. Its surveys show that between 2009 and 2015, for every 1 percent increase in college enrollment, there was a 5 percent increase in the number of students seeking help from psychological services. Because the increase in demand has outstripped the supply of professionals, most college counseling centers across the country did not meet the recommended staff-to-student ratios in 2015. The International Association of Counseling Services deems the appropriate staff-to-student ratio to be one professional for every 1,000 to 1,500 students. Of the more than 350 universities that responded to the National Survey of Counseling Center Directors, 95 percent reported that the number of students with severe psychological problems had increased in recent years. The consensus among health-care professionals is that as more students seek professional help, they have to wait longer to see counselors. And the wait inflicts more emotional stress. Two-thirds of students who are struggling do not even seek treatment, according to the spring 2015 assessment by ACHA. A survey of 139 colleges by the Center for Collegiate Mental Health shows that anxiety is the most frequent health disorder in colleges. Depression is a close second. The National Alliance on Mental Illness says the demand for mental health services and support in community colleges is expected to increase in the next several years. Without adequate treatment, young adults experiencing a mental health problem are more likely to receive lower GPAs, drop out of school, or be unemployed. At Penn State, Leah Yeary thought the phone conversation with CAPS left her thinking her problems weren’t being regarded as valid. “It made me experience a lot of self-doubt,” she said. The appointment she got with CAPS was several weeks out. “What if I was unable to attend classes because I was so distraught?” she said. A few days later, Yeary received a call back from CAPS saying it didn’t take her insurance. She was told that after six free sessions, she would be billed for each subsequent visit. Yeary didn’t end up seeing a CAPS counselor. Instead, CAPS gave her names of local psychologists. She said the psychologists cost around $140 per session, and there was still a six-week wait. “I didn’t feel helped at all,” Yeary said. Asked about student concerns, Mary Anne Knapp, a clinical social worker and senior staff therapist at CAPS, pointed out that the program does offer free services. These include phone screenings, crisis intervention, up to six sessions of individual counseling, group sessions, and workshops. Beyond that, Knapp acknowledged, there are fees. Sessions seven through nine of short-term individual counseling come with a $15 charge. Psychiatric services (meetings with a medical professional to prescribe medication) require a $30 charge and are available only to those being seen for counseling at CAPS. She said referral to local psychologists often meet students’ needs. If students have been in treatment at home and want long-term treatment, CAPS will try to refer them privately so that they can see a therapist throughout their time at Penn State. However, providers in State College are out of the geographic networks of some students’ insurance plans. Knapp said students who receive services from CAPS are generally satisfied, based on the questionnaires that CAPS clients complete after counseling. Complaints like Yeary’s are familiar to Dr. Dennis Heitzmann, senior director of CAPS for the last three decades and a special assistant to the vice president for student affairs. Each student has a 10-minute phone screening before being put on a waitlist for the initial appointment. If a student is considered to be in a crisis, CAPS tries to see him or her as soon as possible. “If it is clear from the initial meeting that the student needs long-term treatment, CAPS will refer them out to a provider in the community that can give them long-term help,” Heitzmann said. Heitzmann said Penn State’s CAPS is on par with other major universities. He acknowledged that all universities have a way to go to provide counseling that meets the needs of all students. Dr. David Spano is director of the counseling center at the University of North Carolina at Charlotte and is the university’s associate vice chancellor for health programs and services. He is also on the board of the Association for University and College Counseling Center Directors and has been involved in national studies of students’ mental health. He said there had been a 25 percent increase nationally over the last year in students visiting counseling centers. He, like Dennis Heitzmann, attributes much of this to a decrease in stigma. Penn State’s Knapp said there were other reasons for increased demand as well. For example, there now are medications that allow students with certain conditions to attend college – students who in the past may not have been able to pursue higher education. Denver Greenawalt, a Penn State junior, had a positive experience at CAPS. Greenawalt experienced his first anxiety attack about year ago – one so powerful that he immediately left the classroom. His thoughts were racing, he couldn’t focus, and he felt a tightness in his chest. Greenawalt couldn’t figure out what was happening, and he was scared. Still, Greenawalt didn’t seek help at first. After four or five attacks, he decided he had anxiety. When Greenawalt decided to seek, he first went to the LGBT Resource Center. There he was directed him to CAPS. Because his situation was considered an emergency, Greenawalt got to see a counselor the next day. After his first consultation, he saw a counselor on a weekly basis. Eventually he decreased his visits to every other week. Greenawalt said he didn’t get a bill. Greenawalt said that speaking with his counselor always helps him keep his anxiety at bay, but he still deals with attacks now and then. Although Greenawalt had a positive experience at the CAPS center at Penn State, he realizes that the system doesn’t work as well for every student. Last year, one of his best friends was also visiting CAPS. She ran out of free sessions, and because of insurance problems, she couldn’t continue her counseling, he said. She started attending the group-therapy sessions at CAPS, which are free. She told Greenawalt that group sessions helped but not enough. CAPS nudged her to find an outside counselor. Greenawalt said students should have access to more than six free sessions at CAPS. Greenawalt said he needed help in addition to counseling, but he didn’t want to go on medication. Instead he got a support dog, an Australian shepherd/golden retriever named Luna. Greenawalt said that if he wakes up in the middle of the night in a panic, Luna is there to comfort him. “I know I can trust her,” Greenawalt said. Emotional-support animals don’t require special training and can be almost any type of animal. With university approval, they can be allowed to live in dormitories. As an RA, Greenawalt lives in a single room where Luna can roam free. She is also allowed in most buildings at Penn State, but Greenawalt has to be sure to take her registration with him everywhere he goes. Greenawalt urges students to talk to a trusted friend if they need immediate help. Garrett Warmbein, a junior finance major, is director of mental health and wellness for the University Park Undergraduate Association. 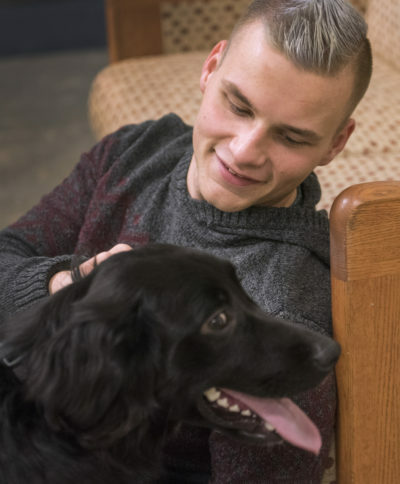 He communicates with both the student body as well as administration about CAPS services, so he can see the situation from both the perspectives of the students and the CAPS professionals. Warmbein said the start of a semester is one of the times when students seek help the most, because “adjusting back into school can be hard for a lot of people.” Other critical times are during midterm and final exams. Dr. Daniel Eisenberg, director of Healthy Minds Network and a researcher at the University of Michigan, hopes to improve understanding of how to invest effectively and efficiently in the mental health of youth. With a background in economics, Eisenberg said colleges can make powerful investments in the mental health of young people. In a survey he conducted this year, two out of three Boston University students reported that there had been at least one day in the past month when emotional difficulty had impaired their academic performance. About 44 percent of the Boston University students said they needed mental health help in the past year, but only half of those actually received help. He said it is difficult to properly staff a service for which the demand fluctuates so dramatically over the year. “If you have enough staff to avoid long waitlists at all times, that probably means that you have a lot of unused capacity during most other times of the year,” he said. Eisenberg proposed expanding the use of alternative therapy, such as group counseling and online services. “I think there is also a hope that preventive services, including online resources, can help stem the increase in demand for traditional services, although that remains to be seen,” Eisenberg said. Garrett Warmbein said that Penn State’s student government is looking into a mental health fee when students pay tuition. Dennis Heitzmann of CAPS is aware of student government’s interest in a mental health fee. He said individual students could be allowed every year to increase or decrease the fee depending on their specific need. Penn State president Eric Barron has addressed mental health in his blog, “Digging Deeper.” He wrote in April that almost half of college students in the nation say they experience “overwhelming anxiety” while in school. He also wrote that 30 percent of college students who seek counseling have considered attempting suicide. Barron wrote in the blog that the Division of Student Affairs has added 20 new positions related to student health, counseling, and psychological services in the last 10 years. Barron also announced during Penn State’s Mental Health and Wellness Week in November that his office intends to match the Student Fee Board’s donation to CAPS — up to $500,000 over the next two years to provide additional funding for Penn State’s mental health facilities. Leah Yeary has some suggestions that she would like to see CAPS adopt at Penn State. She said the university should reach out to insurance companies so that the mental-health fee for students won’t be so high after six appointments with a psychologist. Yeary urged fellow students to find what works for them and stick to it.